I’ve always had a problem with that statement. I am humbled that you are using my outline to teach the doctrine of the church. I know that you will carefully examine it and modify it as the Lord leads. Please let me know if you find things that you feel need to be clarified, corrected, etc. according to the Word of God. I humbly offer the following response to your question concerning a church being a hospital for sinners. I have heard that preached by so-called fundamental Baptists who probably got it from some heretic or apostate of another denomination. 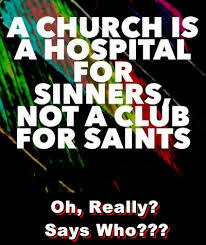 Is a church a hospital for sinners? Yes and no. An assembly of people meeting regularly for some purpose is a church. However, most such assemblies are not churches of Christ, churches under Christ. When Christ declared that “Thou are Peter and upon this rock (Himself), I will build my church,” he knew that there were already churches (ekklesias) in existence that were not His churches and that there would be such churches in the future. He said “I will build my church,” speaking of an institution that would be made up of local autonomous assemblies under Him in all things (See Epheisians 1.22; Colossians 1.18) each following His New Testament principles as to organization, purpose, calling, etc. Christ commissioned his church to go into the world and preach the gospel, baptize, evangelize the saved and to do all that he commanded them. Thus did the disciples; and, on the day of Pentecost, Christ filled them with the Holy Ghost (Acts 2.1-4) as foretold by John the Baptist (Matthew 3.26; Mark 1.8, Luke 3.16). Immediately, Peter stood up and preached the gospel (Acts 2.1-36). “Then they that gladly received his word were baptized: and the same day there were added unto them about three thousand souls” (Acts 2.41). Three thousand souls were added to them (Christ’s church which had waited at Jerusalem)! Those who were saved were baptized and added to the only church under Christ in existence at that time, the church at Jerusalem. “And they continued stedfastly in the apostles’ doctrine and fellowship, and in breaking of bread, and in prayers. And fear came upon every soul: and many wonders and signs were done by the apostles. And all that believed were together, and had all things common; And sold their possessions and goods, and parted them to all men, as every man had need. And they, continuing daily with one accord in the temple, and breaking bread from house to house, did eat their meat with gladness and singleness of heart, Praising God, and having favour with all the people. And the Lord added to the church daily such as should be saved” (Acts 2:42-47). This is the pattern for all believers and churches from that time on: salvation, baptism into a local church body, discipleship in the assembly, and going into the world in accord with His will. God makes this clear as one studies his doctrine of the church as given us by the apostle Paul in his epistles. First, addition to the household or family of God, then baptism and church membership. Of course there are those who get saved and do not become church members, but that is not God’s ideal. He wants every believer to be a member of a local church of Christ. God’s churches under Christ are for the saved and their purpose is stated in Ephesians 4.11-16, 1 Corinthians 12, and other passages. A church is for the saved, not for the lost. Saved church members are to assemble for the purposes given in Ephesians 4.11-16. Then, they are to go out into the world as ambassadors for Christ and preach the gospel to every creature! When sinners get saved, God wants them to be baptized into a local church under Christ. I suggest that 1 Corinthians 2 gives insight into why the local assembly is for the saints, not the lost. The lost are worldly, fleshly. The saved are heavenly, spiritual. Lost people cannot know the things of God as can born again believers. They are dead in trespasses and sins whereas the saved are spiritually alive. They serve the god of this world. “And you hath he quickened, who were dead in trespasses and sins; Wherein in time past ye walked according to the course of this world, according to the prince of the power of the air, the spirit that now worketh in the children of disobedience” (Ephesians 2.1-2). The New Testament teaches that new believers are to be baptized into a Bible believing church under Christ according to Ephesians 4, 1 Corinthians 12, Romans 12.3-8. There they enjoy the fellowship with other believers in the Holy Spirit and are equipped to go to their homes, to the workplace, and to the world as ambassadors winning the lost to Christ and baptizing them into a local New Testament church of Christ. Instead, many churches tell their members to bring the lost to church where they will hear the gospel and do little to mature the spiritual babies in the assembly. Many of those churches will preach nothing but “salvation” on Sunday morning; and, at other times and at best, little more than a few simple fundamentals of the faith. As a result, most believers remain spiritual babies fed with milk (See 1 Corinthians 3.1-3; Hebrews 5.11-14 and 6.1-2) distracted and misled by the many lost in their midst. A small remnant of Christ’s churches carry out His commission and purposes as the mega-churches and false prophets (such as Joel Olsteen) preach the heresies of the devil to assemblies of lost people (for the most part) and lead untold millions to hell (See, e.g., 2 Corinthians 11.13-15). I hope this is helpful. Again, let me know if you believe something needs correction.